Sprinting – two classic sprinting events in one! Anyone who has ever flicked through the excellent tome Drag Bike Racing in Britain by Keith Lee, will undoubtedly have been impressed and astounded not only by the variety of machinery that has been raced up the quarter mile, but also by the numbers that were run by machinery that had no right to be quite that quick. While the book is a retrospective, it is still possible to go and see many of the bikes featured being raced today, and a rather surprising number of them are still being developed and running fastest ever times, occasionally even by the self-same riders that piloted them 30, 40 or even 50 years ago. Trevor Duckworth on the Time Bandit – with 348cc of highly-tuned two stroke, and a riding position closer to the ground than a snake’s belly, a terminal speed of more than 100mph must feel a whole lot faster! And aside from the big supercharged and double-engined monsters tearing up the quarter mile, there are also plenty of surprises in the race paddock too, whatever the venue. 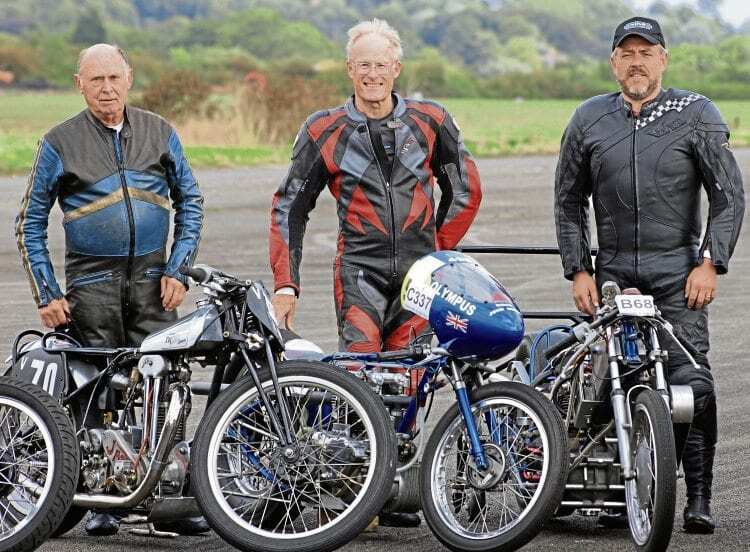 The event with the biggest draw for classic bike fans is Dragstalgia at Santa Pod, although that meeting is predominantly cars, but fortunately there are other bike-only events catering for classic sprinters. A look of pure joy on John Young’s face, it’s clear that this young-spirited gent won’t be giving up on sprints in the near future. 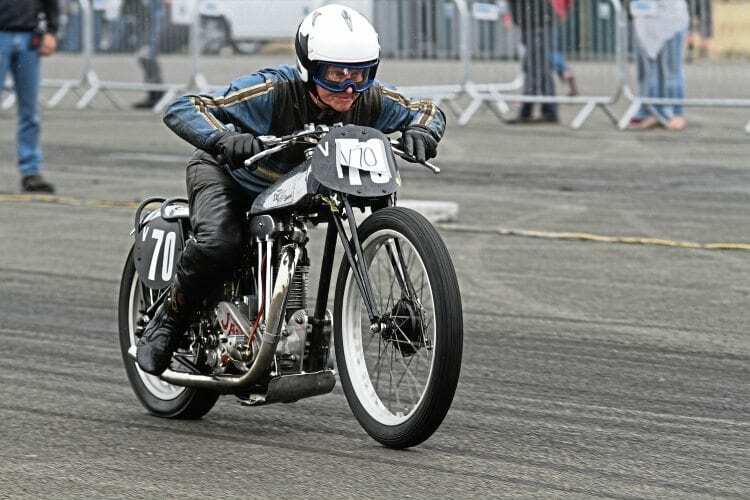 The Straightliners event at Lancaster Raceway at East Kirkby is one such event, paying homage to the legendary George Brown, the racer who not only worked at the Vincent factory and also raced Vinnies at Brooklands in 1937 (clocking 113mph on the outer circuit), but also raced at the TT and on circuits around the UK. After witnessing the horrendous accident at the TT in which Les Graham lost his life, George turned to sprinting. Read more and view more images in the October 2018 issue of OBM – on sale October 6! the National Sprint Association held a meeting to celebrate its 60th anniversary. John Young (left), John Hobbs (centre) and Neil Baskerville (right). The NSA is split into north and south groups, with the southern section running events at Weston Zoyland in Somerset and the northern section at East Kirkby and Santa Pod (and York Raceway if the refurbishing work there is completed). Colin Fallows used not only Super Cyclops, but also this low slung 650cc Weslake, another of the supercharged competitors. While the name suggests that members are focussed purely on sprint-type events, the truth is that their meetings are invariably run in a drag-style format (ie. 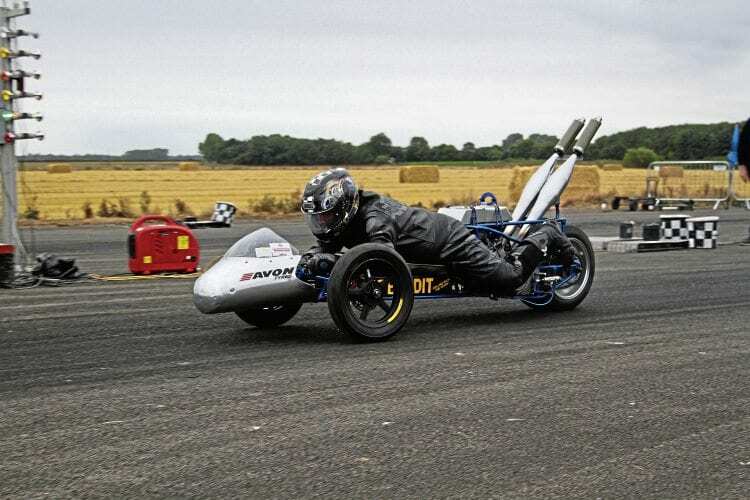 with two lanes and a ‘traffic light’ starting system), and there’s an impressive percentage of members who not only indulge in top speed racing, but who also hold national and world speed records. 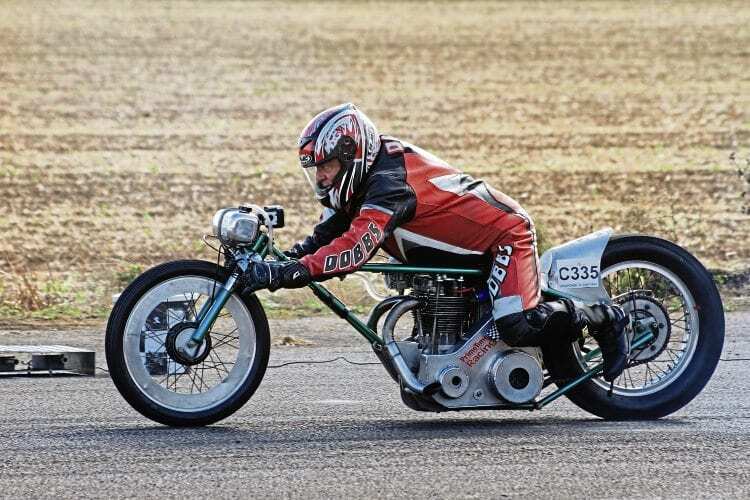 Proof that old bikes still get ridden very hard indeed – John Young spins up the rear tyre of his methanol-gulping Tri-JAP on his way to a 12-second quarter mile. The diamond anniversary meeting had a number of top speed machines on display, as well as many of the expected bikes taking to the quarter mile.